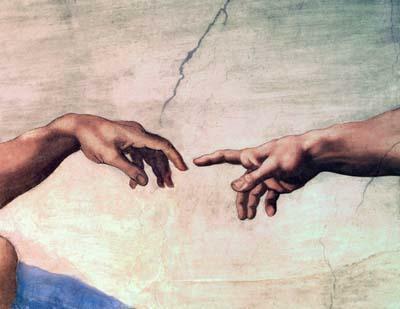 What exactly does it mean to be made in the image of God? Are we actual gods ourself or little versions of God? The first time this phrase appears in the Bible is when mankind is first created. Genesis 1.26 states, “Then God said, ‘Let us make man in our image, after our likeness.’” This verse has a lot packed into it and has been debated for thousands of years. While there are many attributes that we do not share with God, simply because he is the infinite Creator and we are humans, we do reflect much of God’s characteristics by being made in his image. The main purpose for being made in the image of God is that we were created to glorify and praise our Maker, as well as to enjoy exactly who God is. As humans we also are made in the image of God to create because God created everything that exists. This is ultimately the reason why there are so many gifted and talented musicians, authors and performers. God created beauty, and we, being made in his image also create marvelous things as well. We are also spiritual in nature because at his very essence God is a spiritual being. We are not just made of flesh and bone but with a soul and spirit to worship and glorify God. This is how we can pray to God and feel a deep sense of communion when we are worshiping him. As humans made in his image, we are also created to be relational beings, for God has been in perfect communion within the Trinity since eternity past. This is why we are wired to be in relationship with one another and seek to be in community. Even though in this life we are far from perfect, there will be a time when all things are made right and we shall be like Christ in holiness and without sin. Until then, Jesus has promised to be with us, and being made in his image we seek to be more and more like him every day. Sometime this week thank God that we share many characteristics with our Creator and were even created in his image and likeness.